All Cherry Lodge’s services are provided completely free of charge to members (the people who use our services). This would not be possible without the generosity of the many individuals and organisations who support us financially. Up until now, most of the money that has been given to Cherry Lodge has been put into our general reserves to be spent as and when it is needed, rather than being designated for a specific purpose. However, increasingly, people have been asking to be involved in deciding how their donations will be spent. This important service is open to all members, free of charge, with no appointment necessary. Drop-Ins take place each Tuesday morning, from 10 am until 12.30 pm, and on the 1st and 3rd Thursday evenings of each month, from 6.30 pm until 9.30 pm. Currently, morning Drop-Ins are attended by up to 30 people, and evening Drop-Ins by 10 to 15. Drop-Ins provide a safe and welcoming environment where members can socialise, obtain information and receive short sessions of complementary therapies. These sessions are invaluable for helping people to overcome the feeling of isolation that a diagnosis of cancer often brings. Also, confidence can be boosted by meeting others who are going through, or have completed, difficult stages of treatment. Evening Drop-Ins are aimed at those who have finished treatment and have returned to work but want to keep in touch. Smaller numbers mean that members may bring a carer, relative or friend, who may also be able to benefit from a relaxing therapy. Please visit the Services section of our website to read more about our Members’ Drop-In. Cherry Lodge offers its members, free of charge, a range of complementary therapies and psychological support. All are medically approved for people affected by cancer and are provided by qualified, registered and insured professionals. There is also a hairdressing service for people whose hair has been affected by cancer treatment. Following a discussion with one of our Macmillan Cancer Information Nurses, members may request, or be offered, a course of a particular therapy. Individual sessions typically last for 45-50 minutes each (except for acupuncture and spiritual healing, which are shorter). All the complementary therapies help induce relaxation, which people find difficult when going through treatments such as chemotherapy and radiotherapy. In addition to the physical therapies, counselling and hypnotherapy help members to come to terms with their illness and its implications. Booked therapies are very beneficial to, and greatly appreciated by, our members. In 2014 there were 2,454 booked therapy appointments, including 222 for back massage,15 Indian head massage, 601 reflexology, 236 Reiki healing, 68 spiritual healing, 271 counselling, 53 hypnotherapy and 76 hairdressing. The average cost of a therapy session is £51 (comprising therapist’s fee, staff time, travel expenses, overheads and materials). Total cost: £2,407 per week; £10,430 per month; £125,154 per year. Acupuncture is now recognised as a mainstream treatment by the British medical profession and it is used in NHS pain management clinics. At Cherry Lodge we use acupuncture mainly to help alleviate the side effects of chemotherapy, especially nausea and vomiting, and to modify the frequency and extent of hot flushes and sweats precipitated by hormone treatment in men and women. Acupuncture can have pronounced effects on pain, especially headaches, and also helps strengthen the immune system, increase energy levels and facilitate relaxation and sleep. Our Acupuncture Service is provided by three specially trained doctors. There are four 2-hour acupuncture sessions per week, during which time members are given booked appointments lasting between 10 and 20 minutes each. Acupuncture is also available without an appointment at morning and evening Drop-Ins (six times per month). There is further information about our Acupuncture Service in the Services section of the website. The Macmillan Cancer Information Outreach Nurse makes a huge difference to members and their carers, mainly in the west of the Borough of Barnet, where health inequalities are greatest and where there are more members of various ethnic minorities, asylum seekers and homeless people. Our Outreach Nurse conducts regular ‘health and wellness’ sessions, which in 2014 were attended by 892 people in 10 different community venues. Reflexology and massage were also provided and taken up by 166 people during 2014. The Outreach Nurse also facilitates the meetings of the Cancer Carers’ Support Group, held each month at Barnet Carers Centre in North Finchley, and attends the meetings of Sunflower Cancer Support in Burnt Oak. Please visit the Outreach Service and Support Groups pages in the Services section of the website for more information about the Outreach Nurse’s activities. 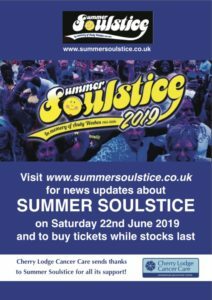 *Starting in 2015, the salary of our Macmillan Cancer Information Outreach Nurse and other Outreach Service costs are being paid for from money donated by Summer Soulstice. 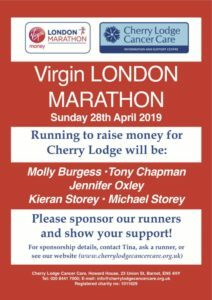 Cherry Lodge is extremely grateful to them for their massive ongoing support for our work and acknowledge this in our Outreach Nurse’s informal title of Soulstice Nurse. There are three well-established support groups for people affected by particular, site-specific cancers: an ovarian cancer group; a men’s group (known as Men Down Under) for members with prostatic and testicular cancers; and a lymphoma group. These groups are open to people who are not necessarily members of Cherry Lodge but who live in the North London area. Group meetings, lasting 90 minutes, are held every six weeks and are facilitated by one of the Macmillan Cancer Information Nurses. These meetings provide an opportunity for mutual support, the sharing of information and discussion of issues arising from cancer treatment. Occasionally there is an outside speaker or a DVD is shown. A new group, for women under the age of 45, was set up in 2015 and is currently being developed. Please see the Services section of the website for more information about Site-Specific Cancer Support Groups. Cherry Lodge offers a Home Visiting Service to members who might find it beneficial. We do not aim to duplicate the role of the Hospice’s Home Care Team. Home Visits by Befrienders: This is the core of the Cherry Lodge Home Visiting Service. Trained befrienders are matched with a member and usually visit them at home on a weekly basis. Befrienders provide members with company, support and sometimes practical help, as well as allowing family members and friends to take a break. All Cherry Lodge befrienders are given specific training and ongoing support. New befrienders must attend an initial induction course, held over a two-day weekend (three times a year). Further training and supervision are provided on a one-to-one basis for an hour every three months and in a group for two hours every three months. It is Cherry Lodge policy that a befriender who experiences a problem on a home visit may contact the volunteer coordinator at any time. There is more information on Home Visits by Befrienders in the Services section of the website. Home Visits by Therapists: This service is provided only on an occasional basis and only to members who have become too ill to attend the Centre. Very experienced therapists, paid or volunteer, who are already acquainted with a member, may sometimes make home visits, always in pairs, to provide therapies. Driving Service: Future plans include the possibility of providing drivers to take members to appointments, for example for radiotherapy, which usually takes place every weekday for three weeks and leaves people feeling very tired. Cherry Lodge offers a range of exercise and other group activities free of charge to members. Some of these activities are led by volunteers and take place in venues that are offered free of charge. Only those activities that incur significant costs to Cherry Lodge are included here. You can read more about all our Group Activities in the Services section of the website. Chi Gung: This gentle exercise, derived from Tai Chi, is ideal for members recovering from the effects of cancer treatment and wanting to start exercising again. It can even be done sitting down if it is too tiring to stand. Sessions are held weekly (from 11 am to 12.30 pm on Mondays) in St Mark’s Church Hall, Potters Road, Barnet. No appointment is necessary and there is no obligation to attend on a regular basis. Yoga: These sessions are relaxing for both mind and body. They consist of a specially formulated series of movements devised for people recovering from cancer. The group meets weekly (from 12.30 pm to 1.30 pm on Fridays) in St Mark’s Church Hall, Potters Road, Barnet. No appointment is necessary and there is no obligation to attend on a regular basis. Singing Group: Singing in a group has physical benefits as well as providing an opportunity for socialising and fun. The Cherry Lodge Singing Group includes members, staff, volunteers and their friends. The group meets to learn new songs and to rehearse at Cherry Lodge on Wednesday afternoons at 4.30 pm on approximately 42 weeks of the year. The Cherry Lodge Singers give around six public performances a year, providing entertainment at events and helping raise funds. Exercise Classes: Costs include hall hire and teaching fees. Singing Sessions: Costs include teaching fees, proportion of staff costs, proportion of overheads. CL Borehamwood Shop – farewell and thank you!